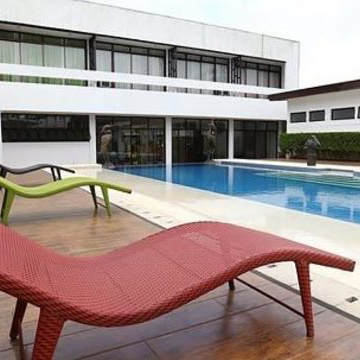 Located in the prestigious and exclusive Tagaytay Highlands estate, the Altamira Boutique House is a charming Balinese-inspired rest house that's perfect for that luxurious vacation you've been dreaming of. Lower Ground Room: This room gives you the easiest access to the swimming pool, the relaxation room, and dining hall. 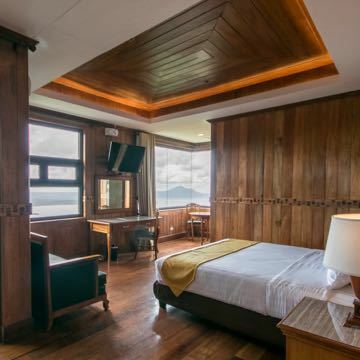 Upper Ground Room: For breathtaking sights of the mountains and lake, this room with a private balcony is the one for you. 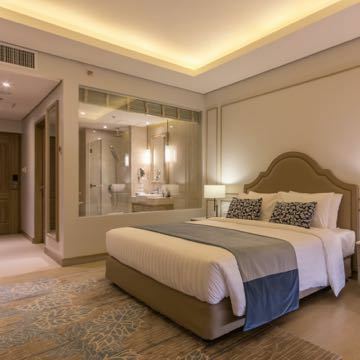 Excellent service begins the moment you step into your home for the night as refreshing dalandan tea will be served upon arrival, together with sugar lemon scented towels. In the morning, choose from these breakfast favorites: tocino, corned beef, OR bacon—all served with garlic rice, egg, and pickled papaya. You need not go far for relaxation and entertainment! The lobby lounge is perfect for chats with loved ones or an afternoon nap. 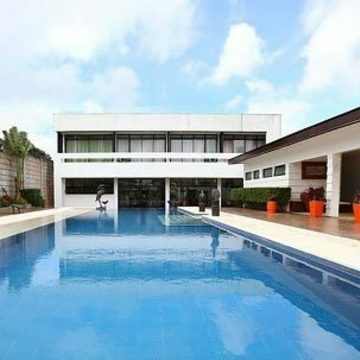 A refreshing swim in the mango-shaped pool is the best way to chill out on a hot day. The relaxation room is where books, DVDs, and games are at your disposal. Endless gorgeous views are yours to take in through the upper balconies and terrace. Meals are best shared with loved ones at the dining hall. It's also a great place to meet fellow guests! For your utmost convenience, service deluxe awaits as your stay includes 24/7 butler service. Worried about getting hungry? Snacks and drinks are made available in a pay as you order basis. Lunch and Dinner Sets are available, too, for a fee, and must be ordered 24 hours in advance through your butler. 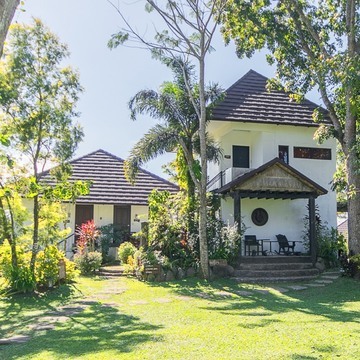 Explore the expansive views and areas of Tagaytay Highlands (see map here), and enjoy yourselves in its public spaces such as the open grounds, library, chapel, and children's playground. 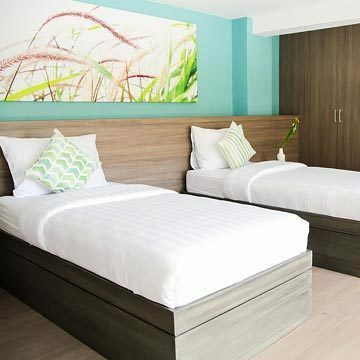 Additionally, a P1000 discount on a Tagaytay Highlands Guest Card is included in this deal! 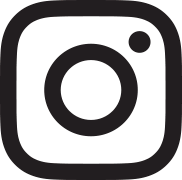 With this card, you can take advantage of members-only, world class amenities and facilities, such as the The Country Club, the Sports Club, The Spa and Lodge, Highland's Steakhouse, Animal Farm, ATV, Horseback Riding, and more. If you're looking for cozy comforts, marvelous views, and top-notch service at an exclusive stay, you've found it right here! Redeemable 'til June 2018. Redeemable from March 11, 2018 to June 30, 2018. Subject to availability. NOT valid on the following closed-out dates: March 29-April 1, April 6-9, April 27-May 1, June 8-12, June 15-17. Subject to availability. For fixed dates, please check availability with Altamira Boutique House prior to purchasing. Altamira Boutique House only has two (2) of these bedrooms available. 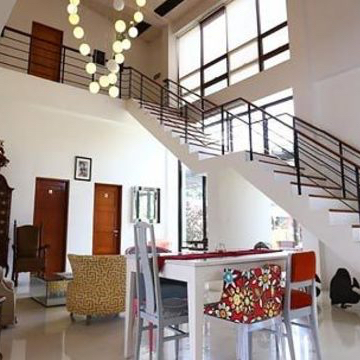 Package is inclusive of: Overnight Stay in a Bedroom for 2 (Upper Floor with Private Balcony OR Ground Floor with Easy Pool/Dining Access); A la carte breakfast for 2; Access to public spaces of Tagaytay Highlands such as the open grounds, the library, the chapel and children's playground (the Cable Car and Funicular Train are currently under maintenance). 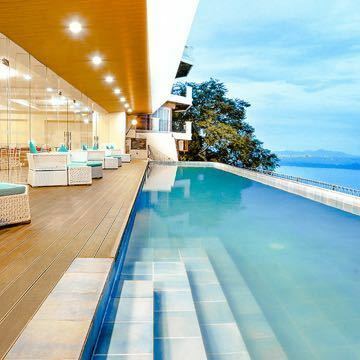 Deal Grocer customers are entitled at a special discount when purchasing a Guest Card, which is needed to access the private facilities of Tagaytay Highlands: Worth Php4,000 (Php2,000 minimum consumable credit + Php2,000 processing fee). Php1,000 (50% of the processing fee) will be waved. Guest Card can be shared by a maximum of 10PAX. Purchase of a Guest Card is to be settled directly with Altamira Boutique House prior to check-in. For the Upper Ground Bedroom, maximum occupancy is: 3 adults OR 2 adults + 1 kid (2 years old and below). A maximum of 1 person (3 years old and up) for a total of 3, may join the room, at a surcharge of Php1,000/night, inclusive of extra bed and breakfast. To be settled directly upon check-in. Up to 1 child (2 years old and below) may stay in the room for free, sharing bed with parents and using the existing bed set-up, inclusive of breakfast. 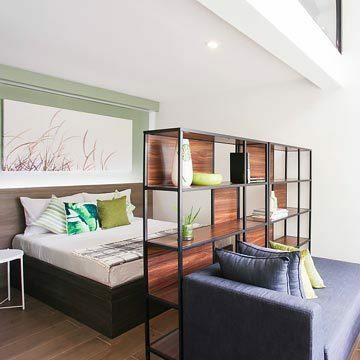 For the Lower Ground Bedroom, maximum occupancy: 4 adults OR 2 adults + 2 kids (2 years old and below). A maximum of 2 persons (3 years old and up), for a total of 4, may join the room, at a surcharge of Php1,000/per person/per night, inclusive of extra bed and breakfast. To be settled directly upon check-in. Up to 2 kids (2 years old and below) may stay in the room for free, sharing bed with parents and using the existing bed set-up, exclusive of breakfast. E-coupon and a valid government-issued ID are required upon check-in. Coupon is nonrefundable but transferrable. If coupon will be transferred, a valid government-issued ID of the voucher owner has to be presented when redeeming the service. 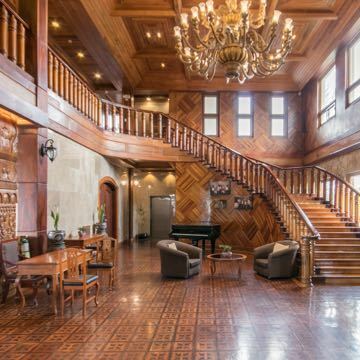 Surround yourself with the comforts of home at this luxe Tagaytay Highlands property. With the best panoramic views and a 24/7 butler service, what more could you ask for?